Jerusalem is hosting the Asian Science Camp for the first time; 2012 is dubbed the "Year of Asia in Israel." ﻿﻿With young people in the Far East becoming a powerhouse in the sciences, Israel excelling as a start-up nation and each side not knowing much about the other, the Asian Science Camp (ASC) is being hosted in Jerusalem by the Foreign Ministry and the Science and Technology Ministry, among others. Over 220 brilliant university students and senior high school pupils, from Asia, aged 17 to 21 have joined nearly 40 Israelis counterparts for the week-long program of lectures by world-class Israeli researchers, including Nobel Prize winners and their counterparts from Asia. 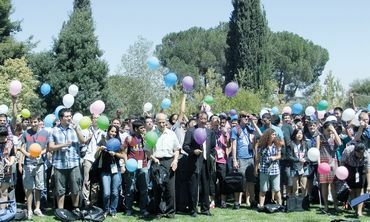 The opening event took place at Jerusalem’s Hebrew University Givat Ram campus on Sunday. Among the laureates are Prof. Aaron Ciechanover, Prof. Robert Aumann and Prof. Roger Kornberg, Prof. Lee Yuan-Ti (chemistry, from Taiwan) and Prof. Makoto Kobayashi (physics, from Japan). President Shimon Peres addressed the participants at the opening. The foreigners come from Australia and New Zealand, China, India, Indonesia, Japan, Kazakhstan, Korea, Nepal, Philippines, Singapore, Sri Lanka, Thailand, Turkey, Vietnam, Taiwan, Georgian, Myanmar, Turkmenistan, Armenia and the United Arab Emirates. The Israelis include Arabs and Jews. Some of the countries represented have no diplomatic relations with Israel and are Muslim. The idea of ASC was co-proposed seven years ago by Prof. Yuan-Tseh Lee from Taiwan, who received a Nobel Prize in chemistry in 1986, and Prof. Masatoshi Koshiba of Japan, who became a physics Nobel laureate in 2002. This year was the first the ASC is being held in Israel, where very few of the foreign participants had been before. Many had never met a Jew – or an Israeli – before and thought it was a “dangerous place” to visit – a misconception they said became apparent within hours of their arrival. 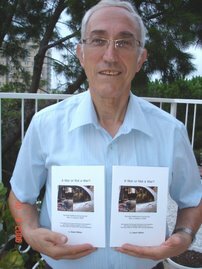 HU president Prof. Menachem Ben-Sasson said the science camp gave his university the opportunity to host the event and deepen the positive image of Israel in academia and science and to make ties with young people who are sure to lead scientific research in their countries. Kaito Ogiyama, an 18-yearold biology student from Tokyo Metropolitan University, said he had already begun his studies, as universities begin their first semester in April. “All I knew about Israel was Jews and war, but nothing else. I already like the food. We will hear what Israeli Nobel laureates have done,” he said, eating lunch at Givat Ram that included meat, vegetables and rice, served quite differently from what he was used to. Htoo Zaeni Oo Mg, a 20- year-old electrical engineering student from Myanmar said his father is an official in his country’s department of agriculture. “I know that Israel is very good at designing and building aircraft,” he said. “It’s a beautiful country. I had been afraid to come; some friends said Israel is dangerous. But it isn’t,” said the citizen of Myanmar, which has a population of 60 million. Aia Bowirrat, a Hebrew-speaking Israeli Arab from a village near Um el-Fahm, has completed high school with high marks and wants to apply to the medical school at the Technion-Israel Institute of Technology in Haifa. Her father has a doctorate in neurology. “He works in Nazareth and does research articles, and I help him,” said Aia, who has four sisters. “The human body is fascinating. I want to be a brain surgeon,” she said. She heard about ASC two months ago, when her physics teacher recommended her. “Sometimes I feel discrimination here, but I am not angry at Israel. Sometimes it’s frustrating, especially for Arab students. Medicine is hard enough. There are many obstacles. But I believe in myself and what I can do. I prefer to study medicine here and not go abroad,” she said. What might civilized people be thinking when sociopaths like Tamimi bask in adulation? After receiving some offline comments on the Tamimi speech we publicized yesterday, we have a few further thoughts to share. The urge to do this is triggered by a sense that something deeply disturbing is going on; it's being ignored or willfully not noticed by people who ought to be noticing. When a politician or public figure on our side of the fence makes an ignorant or dumb or smart or incisive statement, particularly when it's about the Arabs (you know the examples), his/her comments are greeted with near-instant analysis and frequently with condemnation from a global array of press and politicians. The Arab media focus obsessively on such things. Outside the Arab/Islamic world, we frequently see European, American, Australian and other critics drawing wide inferences about how those specific Israeli views are going to bring on the next Black Plague or an increase in pogroms in France. The claim, at minimum, is that irreparable harm is going to be caused to the souls and DNA of innocent Israeli children, to world peace and so on. To illustrate: when a posse of Israeli delinquents (it happens to be a very current issue here) beat up an Arab youth in a street fight, the New York Times says the event has led to "a stark national conversation about racism, violence, and how Israeli society could have come to this point" That's an actual quote: check it out. We think the Times' journalist's conclusion is overwrought nonsense, but that's not the point. Israel is not, never has been and should never be, immune to criticism, or even object to it, and mostly doesn't. Now think for a moment about how Ahlam Tamimi and her hundreds of published interviews and speeches are treated by global public opinion. Pay attention in particular to how Arabs view her, since they are her principal audience. No one - certainly not the woman herself - denies the fact that she planned and carried out a premeditated killing on a large and vicious scale, which was the whole point of doing it. The law convicted her on the basis that she's a murderer; she says (more or less) that she did it for the freedom and honour of her nation. The fact that she planned to kill and succeeded mightily has never been in dispute. She does not miss an opportunity to say that it was children, and specifically Jewish children, and even more specifically orthodox Jewish children like ours, who were the target. She regrets that she did not kill more - it's there in yesterday's video and in numerous other speeches and earlier videos recorded in her Jordanian freedom. She appears on television and in front of adoring crowds (ask us if you want to view the video files) and expresses the vilest kind of racist hatred of Jews, Israelis and Zionists. She has done this many times since she unjustly got her freedom in October and her message is hugely amplified by the social media. She is a star on YouTube, a hero on Facebook. 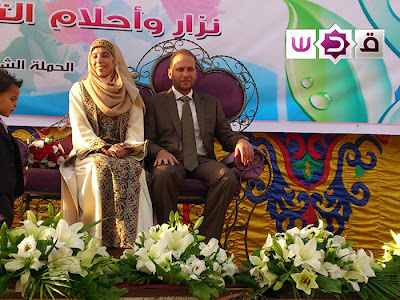 She is globally broadcast via satellite television into every corner of the Arabic-speaking world. It's arguable that she has the largest footprint of any ordinary murderer (ignoring "celebrities" like Hitler, Mao, Stalin et al) in human history. If that seems like an overstatement then we urge you to concede that she is in the major leagues. The fact that most people don't know this is largely because most people don't speak Arabic. She smiles warmly when she says she killed those Jews, and her god wanted her to do it. She points to how she has subsequently been rewarded with freedom, fame, a wedding that received live television coverage. The adoring crowds applaud and ululate. The encouragement (and probably the will) to emulate her actions is clear. How many Arabic speakers are there in the world? A quick query on the web turns up these numbers: "280 million native speakers, and an extra 250 million non-native speakers" [source]. How many Arabic newspapers? Many. Here's our point: We have searched and have not yet found a blog, article, published speech or op-ed in her language, Arabic, which criticizes the woman or her views. So far, not one. If our readers can point us to exceptions, please do. This is deeply shocking. Tamimi's message resonates throughout the Arab and Islamic world. Her views don't even rise to the level of controversial. She's simply a hero, wall to wall. She and her vile deeds, opinions and intentions appear to represent some sort of global consensus in the Arab and Islamic world. There is no public debate, no expressions of outrage - not even concerning the passivity of the Kingdom of Jordan where she lives and from where a vibrant Tamimi-focused industry of online and broadcast videos sends its message of hatred and death out to the world. Does the absence of criticism throughout the Arab world mean they support the deliberate killing of the innocent people among their enemy? Does their silence mean they support the murder of children as Tamimi certainly does, and they want to see it happen again and again as she certainly does? What does this say about the discourse underway in the Arab world? What light does it throw on the global news media? What can we learn from here about the chances of ever making peace? The single greatest misconception about the conflict between Israel and its neighbors is that it's about the Palestinians. A corollary to this is the idea that creating a Palestinian state would be a step toward peace. Focusing on the relations between Israel and the Palestinians turns the conflict inside out. In fact it is driven by the absolute rejection of a Jewish state in the Middle East by all the Muslim nations in the region, which dates back to the beginning of Zionism, before the founding of the state of Israel, before the development of specifically Palestinian nationalism, and long before the 1967 war. This rejection was founded on religious principles and ethnic hatred, and has been aggressively nurtured over the years by various parties - Muslim leaders, the Nazis, British colonialists and the Soviets - and has developed a mythical history whose consequence is that the honor of the Muslim nations and the purity of the land can only be regained by extirpating Jewish sovereignty. A huge amount of anti-Israel propaganda and psychological warfare, much of which was guided by the Soviet KGB, amplified the conflict. In the Arab world, such things as the Protocols of the Elders of Zion, the idea that Israel or international Jewry perpetrated 9/11 (in order to blame it on Arabs), and numerous accusations that Westerners would call 'crazy', are accepted as non-controversial truths. Since 1967, the international Left - especially including Jewish and Israeli leftists - has adopted the Palestinian cause and accepted the historical myth about Israel's creation as ethnic cleansing of a Palestinian nation. While not as gullible as the Arabs, the Left is prepared to believe almost any accusation about Israeli mistreatment of Palestinians, including stories about massacres, murders of Palestinian children, etc. Both Muslims and the Left have been sufficiently impacted by anti-Jewish and anti-Israel brainwashing to the point that they are not able to evaluate information inputs about the subject rationally. Israel, for them, is the Devil. For those of us who still have open minds, the explanatory power of the idea that the basis of the conflict is the existence of a Jewish state and not the lack of a Palestinian one, is obvious. The Arab states have been historically unfriendly to the Palestinian Arabs. During the War of Independence, they encouraged the flight of Arabs from Israeli-held territory. After the war they repressed Palestinian nationalism in their territories except insofar as guerrillas could be used against Israel. Egyptian rule in Gaza was particularly brutal and oppressive. Arab nations except Jordan never gave Palestinians citizenship, and in some cases (e.g., Lebanon and Saudi Arabia), placed restrictions on residence, employment and education that can only be called apartheid. Jordan and Lebanon fought mini-wars against the PLO, and Kuwait and Saudi Arabia expelled Palestinians after the Gulf War. If the Arab nations had wanted a Palestinian state in the territories, they could have established one in 1948-67. But that was (almost) the last thing they wanted! Instead, they fought every initiative to integrate Palestinian refugees, so that they could be used as a weapon against Israel. Even the Palestinian leadership itself famously turned down the possibility of sovereignty in 1938, 1947, 2000-1, and 2008. They tell us that the offers weren't good enough - they lied about the content of the Camp David offer, according to US negotiator Dennis Ross - but one would think that a people thirsting for a state would take an offer, even if it was initially less than what they hoped for (the Jews did). These facts are mystifying if you think that the conflict is based on the 'need' for a Palestinian state. But the mystery vanishes when you understand that it is all about the existence of a Jewish state. No technocratic compromise which would create a Palestinian state while keeping a Jewish one has ever been acceptable to the Palestinians. Currently, they keep coming up with preconditions which prevent negotiations from taking place. Why? Because they know that Israel will not agree to commit suicide. Better to get what they can unilaterally from the UN. Today the military forces poised against Israel come primarily from Iran and its proxy Hizballah, as well as a Syrian regime that is more and more propped up by Iran. Iranian propaganda, of course, pays lip service to the Palestinians, but is mainly focused on the idea that Zionism must be destroyed, and not that Palestine should be established. It goes without saying that if Iran launches its threatened missile war against Israel, Palestinian Arabs on both sides of the Green Line will be in harm's way. If a Palestinian state were created in the territories, neither the Arab nations and Iran or the Palestinians would be satisfied. Mahmoud Abbas of the Palestinian Authority has said that in that case he would press further claims against Israel - for right of return, etc. - in the UN and international courts. Proponents of Boycott-Divestment-Sanctions (BDS) have also made it clear that only right of return and the de-Zionisation of Israel would be a reason to call off their actions. And Hizballah claims that Israel is still 'occupying' Lebanese territory even after the UN carefully delimited the border. 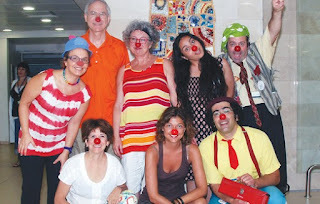 Medical clowns and laughter specialists from around the world﻿ arrived in Israel for the first annual Advanced Medical Clowning International Summer Seminar at the Carmel Medical Center just 5 minutes from out home, reports the Jerusalem Post. Dream Doctors - Israel's leading medical clown organisation currently has 70 clowns operating in 20 hospitals and clinics around the country. For two weeks participants from Holland, Brazil, Canada, Germany, Russia and the USA took part in a program at Haifa University which involved lectures, workshops, roundtable discussions and visits to hospitals. The course was initiated as a resuult of many requests from "clowns" ovwerseas who wanted to improve their skills by learning about the innovations introduced in Israel. Israeli Prime Minister Golda Meir famously lamented that Moses led the children of Israel for forty years of wandering in the desert until he found the only place in the Middle East where there wasn’t any oil. But could Moses have been smarter than believed? Apparently the Canadians and the Russians think so, as both countries are moving to step up energy relations with a tiny nation whose total energy reserves some experts now think could rival or even surpass the fabled oil wealth of Saudi Arabia. Actual production is still minuscule, but evidence is accumulating that the Promised Land, from a natural resource point of view, could be an El Dorado: inch for inch the most valuable and energy rich country anywhere in the world. If this turns out to be true, a lot of things are going to change, and some of those changes are already underway. Israel and Canada have just signed an agreement to cooperate on the exploration and development of what, apparently, could be vast shale oil reserves beneath the Jewish state. The prospect of huge oil reserves in Israel comes on top of the recent news about large natural gas discoveries off the coast that have been increasingly attracting attention and investor interest. The apparent gas riches have also been attracting international trouble. Lebanon disputes the undersea boundary with Israel (an act somewhat complicated by the fact that Lebanon has never actually recognized Israel’s existence), and overlapping claims from Turkey and Greece themselves plus both Greek and Turkish authorities on Cyprus further complicate matters. Yet despite these tensions, following Russian President Vladimir Putin’s surprisingly cordial visit last week, Gazprom and Israel have announced plans to cooperate on gas extraction. This suggests at a minimum that Turkish efforts to block gas development in the region will face opposition from Russia as well as from Israel. Gazprom and other Russian companies are also likely to do well in any gas exploration deals developed with the strongly pro-Moscow (and very cash hungry) Greek Cypriot government. The stakes are not small: the offshore Levantine Basin (which Syria, Lebanon, Turkey, Greece, Cyprus, Israel and even Gaza will all have some claim to) is believed to have 120 trillion cubic feet of natural gas and “considerable” oil. Drillers working in Israeli waters have already identified what look to be 5 billion barrels of recoverable oil in addition to over a trillion cubic feet of gas. (US firms were involved in these finds.) Israel’s undersea gas reserves are currently estimated at about 16 trillion cubic feet and new fields continue to be rapidly found. The new Israeli-Russian agreement is part of a conscious strategy by the Israeli government to use its nascent energy wealth to improve its embattled political position. With Italy reeling under the impact of big wrong-way bets on Iran, Rome may also begin to appreciate the value of good ties with a closer and more dependable neighbor. Another sensible target for Israeli energy diplomacy would be India: the two countries are already close in a number of ways, including trade and military technology, and India is eager to diversify its energy sources. Gas is one thing, but potential for huge shale oil reserves under Israel itself, however, is a new twist. According to the World Energy Council, a leading global energy forum with organizations and affiliates in some 93 countries, Israel may have the third largest shale oil reserves in the world: something like 250 billion barrels. (The US and China are both believed to have larger shale oil reserves, with the US believed to have the equivalent of well over 1 trillion barrels of potentially recoverable shale and China having perhaps one third of that amount. Canada’s Athabaskan oil sands reserves may contain the equivalent of 2 trillion of barrels conventional oil, or more than all the conventional oil known to exist in Saudi Arabia, Iraq and Iran combined.) If the estimates of Israeli shale oil are correct, Israel’s gas and shale reserves put its total energy reserves in the Saudi class, though Israel’s energy costs more to extract. Many obstacles exist and in a best case scenario some time must pass before the full consequences of the world’s new energy geography make themselves felt, but if production from the new sources in Israel and elsewhere develops, world politics will change. The countries along both coasts of the Persian Gulf erupted into global prominence in the 1970s when world energy shortages catapulted them into previously undreamt of wealth and political influence. Those countries will still be rich; for the most part, their energy is cheaper to produce than the more unconventional sources in the rest of the world, including Israel. But what they keep in money they may lose in clout. OPEC’s power to dictate world prices is likely to decline as Canadian, US, Israeli and Chinese resources come on line. The ability of the Arab governments to influence political opinion in Europe and the rest of the world is likely to decline as more oil and gas resources appear — and as Israel emerges as an important supplier. We could be heading toward a time when the world just doesn’t care all that much what happens around the Persian Gulf — as long as nobody gets frisky with the nukes. Another big loser could be Turkey. If Israel really does emerge as a great energy power, and a Russia-Greece-Cyprus-Israel energy consortium does in fact emerge, Turkey will feel like someone who jilted a faithful longtime girlfriend the week before she won a huge lottery jackpot. More, Turkey’s ambitions to play a larger role in the old Ottoman stomping ground of the eastern Mediterranean basin will have suffered a significant check. An energy-rich Israel with a lot of friends and suitors is going to be less dependent on the US than it has been — and it is also going to be a more valuable ally. The emerging new energy picture in Israel has the potential to be one of the biggest news developments of the next ten years. Potentially, the energy revolution and the change in Israel’s outlook has more geopolitical implications than the Arab Spring. Via Meadia will be following this story and trying to make sense of the geopolitical and economic shifts as they occur. If the oil and the gas start to flow in anything like the quantities experts think now may be possible, expect many more visitors to Jerusalem to say similar things to Israelis and the Al Aqsa Institute will have to issue a lot more angry rebuttals. An Israel with vast energy endowments may be less coolly received in certain circles than it is today. In the meantime, we wonder if there was an 11th, hitherto undiscovered commandment on those tablets at Sinai: Thou shalt drill, baby, thou shalt drill.